From The Publisher: Terry Ryan was poised to take the hockey world by storm when he was selected eighth overall by the Montreal Canadiens in the 1995 NHL draft, their highest draft pick in a decade. Expected to go on to become a hockey star, Ryan played a total of eight NHL games for the Canadiens, scoring no goals and no assists: not exactly the career he, or anyone else, was expecting. Though Terry’s NHL career wasn’t long, he experienced a lot and has no shortage of hilarious and fascinating revelations about life in pro hockey on and off the ice. In Tales of a First-Round Nothing, he recounts fighting with Tie Domi, partying with rock stars, and everything in between. Ryan tells it like it is, detailing his rocky relationship with Michel Therrien, head coach of the Canadiens, and explaining what life is like for a man who was unprepared to have his career over so soon. 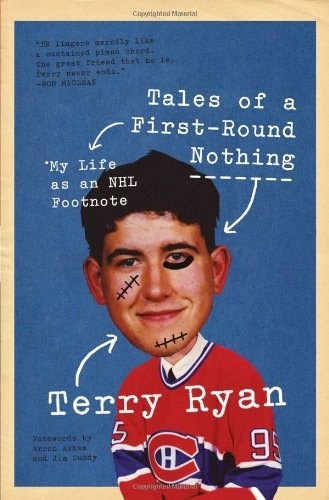 Joe's Note - I wish every hockey autobiography was as open and as entertaining as Terry Ryan's. In fact it should be mandatory reading for any player who is about to write his memoirs. While Ryan's storytelling can be a little crude, a little meandering and lacking a little polish, it was a refreshingly open read that I couldn't put down. Page after page there were more great stories - stuff you couldn't possibly make up. Most jock bios just touch on all the major milestones, often without saying much at all in the entire volume. But Ryan has a fantastic hit on his hand.